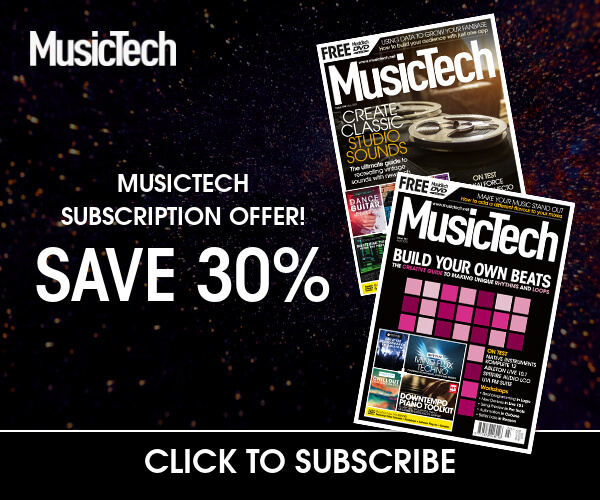 From solutions for sample slicing to analogue outboard with machine learning tech to crossover wearables, we bring you the most innovative products of NAMM 2019. If you’re a serial buyer of loop and sample packs, then Loopmasters could save you wads of cash. In Loopcloud 4.0, the latest version of the company’s DAW-integrated sample store, you can audition samples and loops in your track before purchasing anything. The new Loop Editor lets you cut them up, change pitches, retime them and ensure that the sample you want works before you even buy it. When you’re happy, you can either download the original sample or download your edited version. Loopcloud 4.0 is available for free. The world of studio hardware can seem a long way removed from the rest of the technology sector, but Tierra Audio, a new Spanish pro audio brand, could be changing that. What’s different about Tierra’s products is that they use artificial intelligence and machine learning to perform diagnostics on digitally controlled analogue hardware to ensure everything is working optimally. And, if anything goes wrong, Tierra will automatically alert you via email and send you a repair part so you can easily fix it yourself. Six rackmount devices are expected this year, but we took a look at the first two at NAMM: the Lava preamp and the Boreal FET Compressor. The EC2 from Cranborne Audio puts together two of the company’s Camden 500 preamps into a 19-inch rackmount unit and adds a pair of headphones outs, but it’s the N22 and N22H that are the most interesting new products from the British pro audio company. The new N22 and N22H employ a new system called CAST, which sends four channels of analogue audio down a shielded Cat5/6 cable. The idea is simple: use straightforward and minimal cabling for audio routing between a performance and recording space. McDSP’s APB-16, in our eyes, was the most innovative product presented at NAMM this year. The company’s closed, 1U rack device doesn’t give much away on the outside, but it offers 16 channels of analogue signal processing that can be addressed from your DAW – just like plug-ins. We’ve seen digitally controlled analogue before, but this box offers that on an unprecedented level. And even the way the high-grade analogue components inside operate is pretty ingenious. The only downside is the price. It’s expected to cost in the region of $8,000, which isn’t bad for 16 channels of fully recallable analogue processing, but is probably still beyond the reach of most bedroom producers. We could all do with a few characterful, high-end mics in our collections, but cost can be prohibitive. While there are digital solutions from the likes of Slate Digital and Townsend Labs, Soyuz has come along with an analogue solution: the Launcher. This active, transformer-loaded box adds a stack of gain to your mic’s output, which is really useful if you’re using a dynamic with a lower output. While similar products aim to do that as cleanly as possible, Soyuz is specifically trying to add more colour. As a result, the company says that the Launcher can transform the sound of your cheap microphone into something that sounds far more expensive. And at only $199, its practical applications could be interesting. In the video above, we also check out some other mics from Soyuz so jump to 1:26 for the section on the Launcher. Online music collaboration tools are all well and good, and with over five million users, BandLab has become a significant player in the space. But what if you want to form a real band and don’t already know musicians in your city? BandLab seeks to address this problem with BandLab Creator Connect in version 8.0 of its mobile app (iOS/Android). The new feature lets you swipe through profiles of local musicians showing you what instruments they play, examples of their work, location and photos. In the SR314, Earthworks has seemingly leapt over a series of technical hurdles that have plagued well-known stage mics for years. The first is the proximity effect – a trusty SM58, for instance, will not pick up nearly as much bass if you back off from it. The SR314 solves this with a remarkably uniform frequency response as distance is added. That sonic uniformity also translates to off-axis response, meaning it can make a singer with even the most appalling mic technique sound good. It also, astonishingly, has excellent feedback rejection. Watch the live demo from the show floor at NAMM. Since its inception, Bitwig Studio has been positioned as a next-generation, forward-thinking DAW that isn’t saddled by the old codebase of its rivals. It achieved this to great effect in version two with its system-wide modulation capabilities. Now, in Bitwig Studio 3, we’re seeing the next evolution. Modular sound design is the name of the game here with a new “open modular environment” known as The Grid. So far, so Tron, but it allows you to build simple and complex processors, sound generators and much more in a Reaktor-esque way, all from within the base software. The DPA 6000 Series mics, released late last year, really are an engineering marvel. At only 3mm in diameter, they are vanishingly small. Hear them, though, and you’d never know you weren’t listening to a high-end studio microphone. The 6000 Series subminiatures come in lavalier (tie clip) and headset models, and excel in any scenario where the mics need to be discreet. That’s why they’ve found favour among film, TV, stage and broadcast sound engineers. They’re not cheap but if you want innovation, look no further. After much consultation with their users, wearable tech company Soundbrenner has announced a smartwatch that caters to the needs of the musician. In the Soundbrenner Core, the Bluetooth-syncable vibrating metronome found on the original Soundbrenner Pulse is joined by a magnetic, chromatic tuner that twists out of the strap, a decibel meter that warns you when you’re being exposed to dangerous sound pressure levels, and the ability to control your DAW. All that and it still manages to tell the time. Pricing is unconfirmed but we expect it to cost around $199. The Ascender from Ciari Guitars is the first and only full-size travel guitar with symmetrical folding for the smallest travel footprint. In fact, it’s the only guitar that will fit under a commercial airline seat. The innovative design uses some clever engineering to move the bridge, slackening off the strings so there are no restringing hassles either. We took a closer look at NAMM. Head to this page for all things NAMM 2019.